We’ve all heard how important it is to develop an email list and grow a following. Collecting the contact information of your potential clients gives you a way to connect with them and build relationships. Over time, these leads will come to view you as a trusted expert, and will be much more likely to buy than when they first stumbled across your website. In order to do this, though, you have to collect their contact information, most especially their name and email address. But how do you get them to want to give you that information? That’s what “Lead Magnets” are for! A “lead magnet” is simply content that offered at no cost, in exchange for someone’s contact information. A well-crafted offer has great appeal to your target audience but doesn’t appeal too much of anyone else. This means everyone who signs up to get the lead magnet is your ideal customer, and your list is automatically filled with hot leads. Lead magnets are win-win. You get the contact information of a potential customer, and they get valuable information that will help them. You become viewed as a knowledgeable expert, and they discover someone who can offer them further help. Lead magnets grow an ideal email list. They fill your list with people who want what you have to offer and have freely asked to receive. They gain you subscribers who are actively looking for answers to their problems. These are the easiest customers to eventually sell to. They get people talking. Offering a high-quality lead magnet is a sure way to get people to share with others about you and what you do. This means that even people who aren’t yet your paying customers will be giving you referrals and free advertising. Sounds amazing, right? Want to use this awesome strategy, but don’t know where to start? Just keep reading! 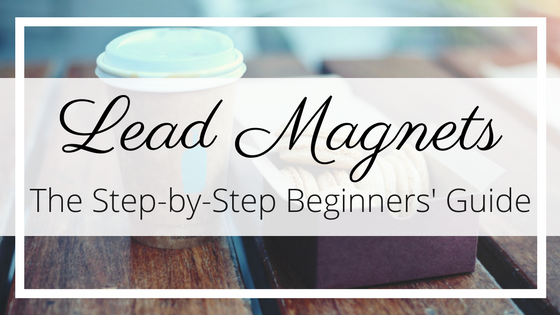 This guide will teach you step-by-step how to create your first, stunning lead magnet that will draw in your ideal customer, grow your email list, and really get people talking. What is a good topic for your lead magnet? The answer to this question depends entirely on WHO your target audience is. The topic and title will determine who the lead magnet appeals to and who signs up for your list. 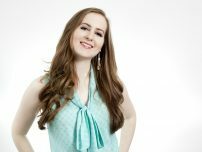 You want your list to be full of your ideal customers, so you must make sure that your lead magnet will be most attractive to that type of person. Consider what your ideal customer’s greatest desires are. What do they want most? Now, what are some steps to attain this main desire? For example, if their greatest desire is to learn how to eat healthy food, then steps along the way might include: learning what is healthy and what isn’t, learning how to shop for healthy food on a budget, learning how to cook healthy food when they are busy, learning how to LIKE eating healthy food, etc. Here’s another example: Your ideal customer’s greatest desire is to teach their child how to read. Steps to get to that end goal could include: finding books that motivate young readers, learning tips to encourage & motivate their child, or discovering strategies for getting started. You can also consider the primary pain-points of your target audience. What are their biggest problems? What keeps them up at night? Then, determine what specific, smaller steps they could take to alleviate this struggle. For example, if your target audience struggles with a chaotic, out of control house, then specific help they would appreciate might include: learning what the most important chores to do each day to keep their house under control are, learning how to declutter, motivating their kids to help, or discovering storage systems to help them keep things better organized. 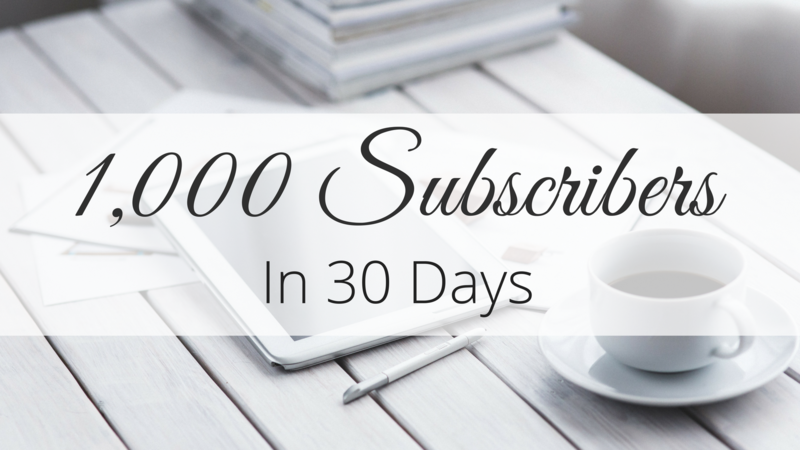 For even more guidance on how to figure out exactly what your audience wants, be sure to check out “1000 Subscribers in 30 Days” which includes a complete lesson devoted exclusively to this topic! Once you’ve identified what would motivate your customers to want to buy your service or product, it is then time to craft some potential offers. The title/subtitle of the lead magnet should clearly explain the benefit of the offer to entice visitors to take you up on it. Once you’ve developed 4 – 5 potential lead magnet offers that would appeal to your specific, target audience, it’s time to decide which one to create as your very first. While you might have one that you think is the best, nothing beats actually asking your audience what they want. There are lots of ways you could do this, but the fastest, easiest way is generally to simply post a poll in a Facebook Group. Make sure to post it in the group that is most specifically your ideal customers. Posting the poll in a big group will get more responses, but posting in a very targeted group will give you the correct responses. After you ask, follow the advice you receive. I know this is obvious, but really, do it! Don’t think you know better than your audience what they want. Whatever they ask for, help them try to achieve that. Now that you have a topic selected, it’s time to create the lead magnet. Start with a simple outline. Make sure that your content does what it claims to. If you title your lead magnet, “Teach Your Child to Read in 5 Easy Steps,” then don’t just give five random tips. Again, obvious, but so important! Don’t worry about making it “pretty” at first. Just focus on creating quality content that will give your customers results. After you’ve created your content, it’s time to turn it into something beautiful and attractive. You’ve probably heard the phrase, “We eat with our eyes first.” This means that when people consume anything (food, a book, anything), they judge it first on appearance. You can offer your customers amazing content, but if it’s not attractive they won’t click, and if it’s unprofessional looking after they download it then they will be disappointed. If you struggle with visual design, don’t worry. There are amazing tools available to help you and make this process virtually painless (even fun!). But before you pick what tool to use, you first must get an idea of what you want the final product to look like. The #1, most important aspect of the design is that it is consistent with your branding. (Okay, really the most important thing is that it looks professional and attractive, but those things are obvious.) Make sure that you use your colors and fonts, of course, but, more than that, the content must fit the FEEL of your brand. Sometimes, you might even use different colors or fonts, but the FEEL still has to match. The other thing you should consider about the design is what the visual elements need to accomplish. Is your content mostly just text, with images for visual interest? Or do you need pictures to “show-and-tell” how to do what you are describing? Do you need a checklist? These days, even a basic word processing software can take you pretty far! Most have plenty of templates that include endless options of colors and fonts, borders, footers, and headers. You can easily add pictures and checklists as needed. If your content will be mostly text based, and you want a simple, clean look, a word processor will be the easiest option. Google offers many different free, online web applications that work very well. “Google Sheets” is their version of PowerPoint and is used for creating slides. Now, before you start thinking that this isn’t for you because you don’t want to create a slideshow, hold up and hear me out. These “slides” can be customized effortlessly with text, graphics, charts, and all sorts of visual “drawing” elements that a word processor doesn’t allow. You can create shapes and easily drag and drop them anywhere you like. The “slides” or pages, can be any dimension you prefer. This is the most flexible tool available. Canva is ideal if you want to create more elaborate, graphics-heavy designs, and if your content won’t be too many pages (it will let you create up to 25 pages of content as one file) and isn’t too text focused (Canva is NOT a word processor). Choose your tool, then start designing! Begin with a basic outline of what you want the design to look like. Create a cover/title page, and a template for all of the following pages of content (the template can include a header, footer, and/or border). Once your template is complete, add your text and graphics. When in doubt, less is more. Better to keep the design simple and consistent with your branding than to try to make it very “fancy” and end up with something ugly. Please do NOT deliver your lead magnets as text documents unless you have a very good reason to. People are much more likely to have trouble opening such files on their computers, and the fact that they can be edited makes them appear unprofessional and not like a finished product. Even if your file is only text, taking the very easy step of turning it into a pdf will make it seem more valuable. That’s all there is to it! Your lead magnet is fully created and ready to start drawing in ideal customers. Now you can simply publish it on your website and start sharing the link to it on social media. What do I mean by “publish” your lead magnet? Simply add the cover graphic as an image on your website along with some promotional text and a link to download. You’ll also need some type of opt-in form for people to input their name and email address. There are free options you can use, like plugins such as “Opt-In Monster,” and also numerous paid options, such as Lead Pages, Thrive Opt-Ins, Convertkit, and Infusionsoft. Any of these will give you a form to put on your site, and will provide your customer with access to the file after they input their information. However, you’ll also need an email marketing tool (such as Convertkit, Aweber, Mailchimp, etc.) to store and utilize the email addresses that your form collects. Your published lead magnet is a powerful asset to your online business! By directing your traffic to this content, rather than to your services page or to a paid offer, you’ll gather more leads and ultimately make more sales. Putting your best lead magnet write on your home page can be a great way to grow your list quickly. Once you’ve created one awesome lead magnet, don’t stop there! Create at least a few more to appeal to other needs and desires of your target audience. Offer them all on a “free resources” page on your website, and link to them in related articles that you publish. Just like the name implies, lead magnets are an amazing tool you can use to really “attract” ideal leads. So take action! Start thinking about what quick wins your audience would love to achieve, and then create something that will enable them to accomplish these things. An email list is worth taking the time to grow because it truly is one of the most valuable assets of any online business. It’s how you connect with your customers, build relationships and promote your products. If you’re really serious about building your email list, make sure you check out “1000 Subscribers in 30 Days.” Having a step-by-step road map will enable you to grow you list so much faster! If you need any help creating your first lead magnet, be sure to reach out. You can access me directly by emailing contact@gillianperkins.com, or connect on social. I can’t wait to hear from you and see the beautiful lead magnets that you create for your audience.